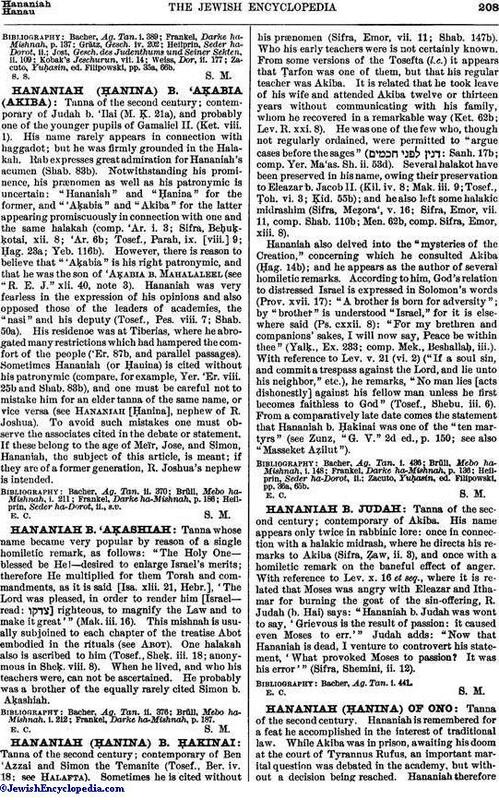 Tanna whose name became very popular by reason of a single homiletic remark, as follows: "The Holy One—blessed be He!—desired to enlarge Israel's merits; therefore He multiplied for them Torah and commandments, as it is said [Isa. xlii. 21, Hebr. ], 'The Lord was pleased, in order to render him [Israel—read: ] righteous, to magnify the Law and to make it great'" (Mak. iii. 16). This mishnah is usually subjoined to each chapter of the treatise Abot embodied in the rituals (see Abot). One halakah also is ascribed to him (Tosef., Sheḳ. iii. 18; anonymous in Sheḳ. viii. 8). When he lived, and who his teachers were, can not be ascertained. He probably was a brother of the equally rarely cited Simon b. 'Aḳashiah. Frankel, Darke ha-Mishnah, p. 187.